Fontes visited the Kindergarten projects in March 2007 looking after the progress of the construction of a second kindergarten called Bushura Nursery School. 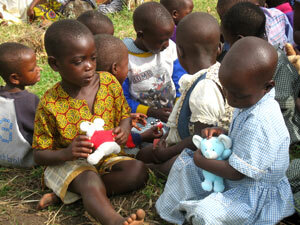 During that visit, we handed over gifts, toys and learning equipment, to the nursery, donated by a swiss lady. The building itself is soon at the stage of roofing, and will have two class rooms and one office for the teachers. At Mama Barbara’s Nursery the flooring has been finished and the walls have been painted white inside, lightening up the rooms. 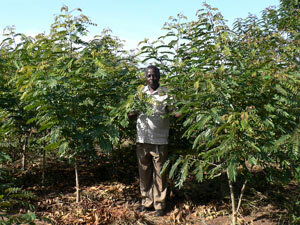 The tree planting project in Katunguru is progressing well. The intention of the tree planting project is to give the School and additional income from which they can but better materials and improve the conditions at the school. The tree planting project was initiated in March 2006, and the trees seen on the photo are one year old. Firewood is scarce in the area, and by the school producing this commodity they will not only improve the situation of the school, but also for the around lying villages. The two former Katunguru Primary School students who have been approved a scholarship through the Fontes Scholarship Programme finished the first semester of 2007 with good grades. Paul (left) became number 6 out of 93 and Pascal was number 4 out of 93. We are also happy to see that they have applied their skills learned in school to improve the situation in their village Katunguru.